Hivos > Uncategorized > Syria: Free Prominent Rights Defenders! Syria: Free Prominent Rights Defenders! UPDATE: For the third time in a row, the Terrorism Court in Damascus delayed the verdict in the case of the Syrian Center for Media and Freedom of expression, which was scheduled for October 1, to November 5, 2014. The rights advocate and journalist Mazen Darwish, Director of the Center, and his colleagues, the university professor Hani Zitani and the blogger Hussein Ghreir, will soon complete two years in Adra prison after they had been spent 9 months of compulsory disappearance. They were arrested on February 16, 2012 by the air-force intelligence agency, a period during which they were subject to torture, humiliation, harsh treatment, and deprivation from their basic civil rights. Hivos reiterates its demand that the concerned authorities release, immediately and without conditions, Mazen Darwish and his colleagues, in accordance with its international commitments towards the UN and the relevant international legal organizations which work on defending human rights and freedom of expression, as well as in accordance with the Syrian constitution, which guarantees the freedom of belief and expression, in addition to the current impasse of the Syrian situation, particularly after the public space had been emptied from the peaceful, civil, wise activists. Darwish is the director of the Syrian Center for Media and Freedom of Expression (SCM). Syrian Air Force Intelligence arrested the three men and other colleagues during a raid on the group’s office, in Damascus on February 16, 2012. The three men have been on trial before the Anti-Terrorism Court on charges of “publicising terrorist acts” under article 8 of the country’s 2012 Anti-Terrorism Law. The charges are based on their peaceful activities that include monitoring and publishing information about human rights abuses in Syria. A May 15, 2013 UN General Assembly resolution included a demand for the immediate release of the three men. On January 2014, the UN Working Group on Arbitrary Detention (WGAD) found that the three had been arbitrarily deprived of their liberty due to their human rights activities and called for their immediate release. The United Nations Security Council demanded the release of all arbitrarily detained people in Syria in its resolution 2139, adopted on February 22, 2014. 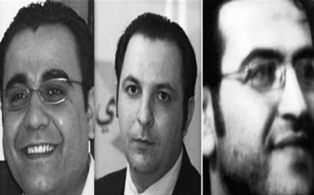 On June 9, the government announced an amnesty, including for the charges that Darwish and the others face. They have not been freed, however. Hivos has a partnership with the Syrian Centre for Media and Freedom of Expression (SCM) since the middle of 2010. For a decade, Mazen Darwish and his colleagues have courageously promoted human rights and fundamental freedoms in Syria – an authoritarian state with a highly repressive regime.